NEXT | New Hearthstone TV spot featuring Tinkmaster Overspark! The patch 6.2 Q&A last weekend covered a lot of player questions regarding upcoming content in patch 6.2, but there wasn’t time to answer all the questions out there. To address this, as well as clarify a few comments that were made during the Q&A, Lead Game Designer Ion Hazzikostas hopped on the forums and made a post. 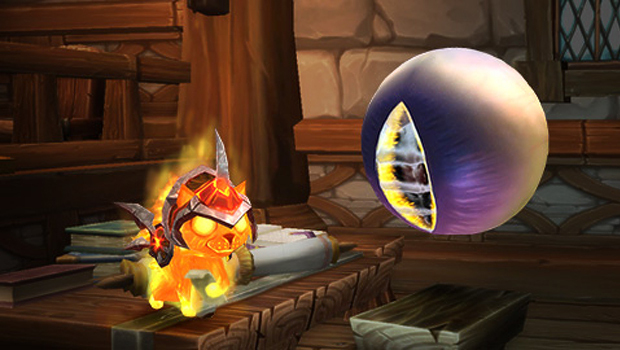 Along with clarifying his comments on Demonology Warlocks and Discipline Priests, he tackled some questions regarding itemization, future stat squishes, improvements to the vote-to-kick system, and much more. If you missed the Q&A from Saturday, you can catch it in its entirety over on World of Warcraft‘s YouTube channel. I had a great time doing the Q&A this past weekend, and look forward to more opportunities to speak directly with the community and field your questions. I wanted to take some time to clarify a couple of my responses. I’d also like to address several questions that were in the queue, but which we weren’t able to reach before we ran out of time. The infamous Demonology warlock response: We’ve heard from many players that they don’t enjoy the spec but feel pressured to play it because it has so clearly been the all-around best warlock spec in current raiding, and we’ve seen masses of warlocks who started out favoring Affliction or Destruction migrating steadily towards Demonology. We feel the spec has several elements that are awkward and unintuitive (it’s not just a matter of sheer “complexity” – it’s fine for some specs to be more challenging to play optimally, especially for pure DPS where players can choose to opt into that complexity while having alternatives available), and we have plans to rework (and hopefully improve) the spec, but those changes are beyond the scope of a patch. In the meantime, we want to make sure we’re alleviating the pressure to play Demonology over other specs, which means making sure that it isn’t the best warlock spec. The goal of our 6.2 changes is not to make Demonology terrible or unplayable, and I’d expect Demonology to still be quite competitive on some types of encounters, and viable everywhere. If it isn’t, we’ll make further adjustments to compensate. But we did intentionally make changes to ensure that it isn’t the single best warlock spec in patch 6.2, and I wanted to make it clear that this was our intent, rather than simply a mathematical error. Healing priests: In the Q&A, I fielded a question about absorbs, and have seen feedback about a seeming contradiction between our stance on Demonology warlocks (“we don’t want all warlocks to feel obligated to play Demo, so we’re nerfing Demo”) and my comments about Disc (“you’re probably doing it wrong if you only have one priest in the raid and that priest isn’t Disc”). To be clear, we don’t think the current state of priest healer representation is a desirable one – I was describing the present reality, not stating our design goal. But the Discipline problem isn’t one that is solvable with simple numbers changes – we’d have to nerf Discipline to the point of complete uselessness in order to meaningfully affect their representation. The issue lies in their nature as an absorb-based healer, offering a unique benefit that neither Holy priest nor any other healer can provide, and often doing so at the expense of the fun of other healers (whose core gameplay lies in refilling health bars that now empty less, or not at all, due to absorbs). Absorbs are still interesting as a mechanic, and we’re not looking to prevent Disc from feeling unique, but the spec’s niche in multi-healer situations probably shouldn’t be mechanically blanketing allies with absorbs. In short: we acknowledge that there is a problem, but we don’t have a solution to discuss just yet. Now, Lore gave me a list of questions that we didn’t get to on Saturday, and I’d like to take a stab at answering a few more. Some of these are things I could probably ramble on about for pages, but I’ll try to stay concise to keep the responses in line with the content of the rest of the Q&A. A: Overall, we’re happy with how most of the changes have played out. Bonus gear properties in particular keep “farm” content potentially rewarding and create some extra moments of excitement, as designed. Tertiary stats were too weak initially, but since the 6.1 changes they’re in a good place – I’ve seen people get more excited for a huge Speed or Avoidance bump on a primary gear slot than they would have been over a socket, which is pretty cool. As far as stats go, and this may surprise players somewhat, we’re pretty satisfied with how Versatility has turned out – it’s a simple baseline stat that’s easy to understand, and has some depth to it especially in PvP. It may not be the favorite stat of any damage-dealing raiders, but that’s okay – it’s a solid baseline. Multistrike is probably the weakest of our current stats from a design perspective. Mechanically it’s very similar to crit, except where we’ve added specific class mechanics to hook into it and bolster it as a stat. There may be a visceral feel at times to firing extra missiles, but when you’re firing a ton of projectiles all the time, that also comes at the expense of lessening the impact of each individual missile and cast. A: Well, players are currently dealing damage roughly on par with what we saw at the end of Dragon Soul almost 4 years ago, which is fairly significant. If not for the squish, we’d be seeing DPS values in the millions, player health well into the millions, gear having 5-digit amounts of each stat, and so forth. So the squish did do quite a bit. Experience has shown, however, that if a full tier of gear doesn’t increase player stats by at least 10-15%, upgrades feel unrewarding. The compounding nature of that growth does mean that numbers will get unwieldy over time. We don’t see the need for another stat squish in the very near future, but we’ll likely end up doing one again eventually. A: The vote-to-kick system in our Group Finder is definitely due for some improvements. The system was designed alongside the original introduction of the LFG tool years ago, in a world where the default loot method was Need/Greed and a major issue was people abusing the kick feature to eliminate competition for loot. Nowadays, there are far fewer selfish motivations for initiating a kick, and so it makes sense for us to reevaluate that design. In Raid Finder in particular, one person who is griefing is having a negative impact on the gameplay experience of up to 24 other players, and we should make sure we’re weighting the protections provided by the system accordingly. We are working on making some subtle adjustments to the logic involved that should address some of these issues: for example, just because you’re in combat doesn’t mean you shouldn’t be able to kick someone who deserves it – that restriction used to be in place to prevent loot abuse, but now loot is mailed to players who aren’t around to receive it. We’ll continue to keep an eye on the system and make additional tweaks aimed at reducing player frustration. A: Totems could definitely use some love. I’m not sure the core rotations of either spec need an outright “rework,” though there are certainly some issues (Ele Ascendance being numerically underwhelming, Enhance having so many different sources of damage that few individual button presses feel rewarding). Totems historically provided irreplaceable benefits (e.g. Windfury providing extra attacks) that were balanced by the spatial constraint of being tied to a killable totem in a fixed location. Now that drawback often feels unwarranted. There isn’t much that’s cool about an ability like Searing Totem. Powerful area effects like Earthgrab, Windwalk, or Healing Tide fare better, but that isn’t a very long list. We agree that totems need to either be overhauled as a mechanic or that their importance to the shaman class needs to be reduced. A: For many hybrid casters, mana is little more than a constraint on ability to heal, allowing for hybrid offheals to be potent, but limiting their sustainability so that they clearly fall short of a dedicated healer. Beyond that, we agree, there isn’t much point to the resource for several specs. Mana works well as a healer resource, where mana management and efficiency are designed to be a core part of every healer’s gameplay (some specs’ current situation notwithstanding), but we moved away from having it as a meaningful constraint on DPS output because it generally served as a frustrating constraint in a world where many if not most other DPS specs were not similarly constrained. Arcane mages stand as the exception, but they have a toolkit specifically designed around controlling their mana pools. I don’t think we’re likely to return to a world where Elemental shamans can run themselves out of mana and end up unable to cast Lightning Bolt, but perhaps there are more interesting things that could be done with DPS resource bars in place of mana. A: Clever players have been using add-ons to assist with raid coordination since the earliest days of WoW raiding. When these add-ons have crossed a line and approached automating player activity or decisionmaking entirely, we have stepped in to disable or limit the underlying functionality that made that possible. Beyond that, players’ ability to use mods to help keep track of non-random abilities isn’t particularly concerning – as a raider myself, I downloaded Thogar Assist as a reference, but found that by the time my guild defeated the encounter I had long since memorized the train schedule. It is something for us to keep in mind, however, and we do occasionally alter our designs when we realize that a mod would completely trivialize the intended gameplay. Kromog, for example, could have had another dozen or so hand spawn points, and randomly picked a subset of them each phase, preventing any sort of fixed 1-to-1 assignment. A: Never. (Or at least not until next time we do a stat squish, technically.) The “legacy buff” that applies to enemies below level 90 once you exceed that level was designed specifically and solely to offset the 6.0 “stat squish,” which compressed the exponential scaling in the items available from level 61 to 90, into linear scaling. Pre-squish, a level 90 player with Pandaria raid gear was literally a dozen times more powerful than they had been at level 80 with Wrath gear. Post-squish that is no longer the case, so we have a special combat modifier in place to preserve the expected gameplay, so that soloing old content does not become harder. Gear higher than item level 463 wasn’t squished, so endgame Mists content designed to be tackled by players of that power level wasn’t affected and no combat scalar is needed. Mists content will increasingly become doable with fewer players than intended, as player power continues to rise, as has always been the case. People already are soloing large chunks of Mists content, and that goal will only become more and more attainable as time goes on and gear continues to improve. A: No. At this point, while we may still be making numerical adjustments, I wouldn’t expect new abilities or class functionality in 6.2. We removed Aspect of the Fox from hunters because they simply did not need it to be unique, viable, and in fact highly desired. It also contributed to elevating ranged classes above melee in many cases, by offsetting one of most casters’ main weaknesses. One of the strengths of melee classes is that they can move along with their target and continue to deal full damage while on the move, while most casters’ throughput suffers if they can’t stand still. In encounter design, we create mechanics and phases with this constraint in mind, with the expectation that a ranged-heavy raid will have its throughput suffer during something like Hans’gar and Franzok’s Stamping Presses phase, or Blackhand’s Massive Demolitions. Each additional Aspect of the Fox eroded this natural melee advantage, and contributed to raid composition and balance issues. Even without Fox, Hunters are unique in that they are the only ranged DPS that can do nearly everything while on the move, which naturally makes them well-suited to specialized roles on a number of encounters, aside from naturally thriving in high-movement environments. On top of that, Deterrence, Feign Death, Misdirection, and Disengage all allow them to assist with handling mechanics in ways that many other classes cannot. As for Mages, Amplify was not nearly as impactful, but neither was it necessary to justify the inclusion of a class that already brings a versatile toolset, burst damage, control, and useful immunities. A particularly odd feature of both Aspect of the Fox and Amplify Magic is that neither ability had any apparent use whatsoever when solo, which contributed to their awkwardness. In short, we added those abilities in 6.0 because we were concerned that mages and hunters might not be well-represented without some new and unique raid cooldown, but having observed how they have played out in practice, those concerns were likely unfounded, leaving us with two new niche abilities at a time where we have otherwise been trying to streamline the contents of class spellbooks. Thus, we’re removing them in 6.2.